Installation view of Summer Selections at Art Projects International, New York, 2010. Art Projects International is pleased to present Summer Selections – Jean Shin, Gwenn Thomas, Pouran Jinchi, Richard Tsao and Il Lee. The artists’ most recent works are on view along with their early important works. Jean Shin’s Altered Trophies, from her project Everyday Monuments, celebrates the unsung heroes of our society whose everyday labors go unrecognized. Starting with donated sports trophies, Shin transforms each figure’s sports-star pose into an unsensational yet distinctive gestures of work. Each set of altered trophies becomes a small tribute to people who deliver packages, vacuum, shovel, sew, etc. each day. 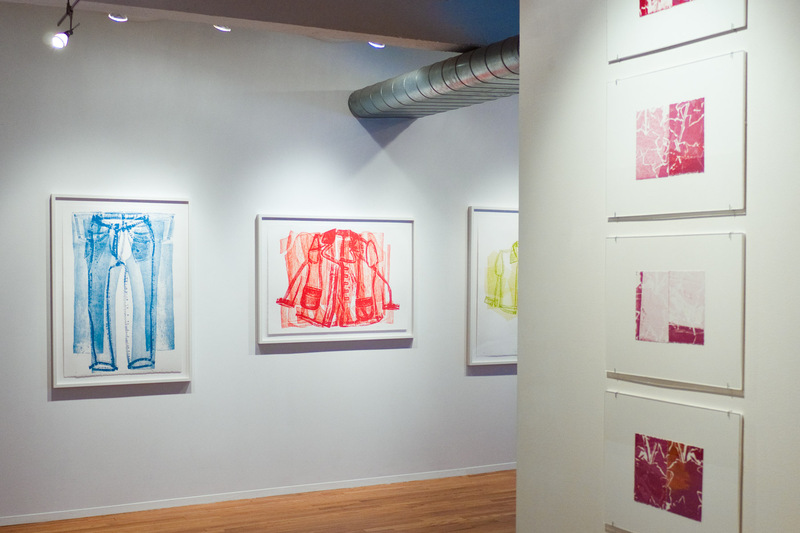 In Shin’s earlier series of relief prints, Pressed, the artist has used a collographic process—taking her own blouse, pair of jeans and coat and deconstructing them into fabric cut outs and seams to create the printing surface. Collectively the collagraphs make up a self-portrait and are related to Shin’s 2004 MoMA installation Cut Outs and Suspended Seams, a portrait of the MoMA staff. Gwenn Thomas’s recent series entitled Soundings continues her reference to sound as an underlying component of her color etchings including the series Echoes, Song, Amplitude, and Sonancy. Going beyond suggestions of synesthetic associations between color and sound, Thomas’s Soundings work have the viewer thinking of the measurement of unplumbed depths through title, hue and carefully arranged forms. This series can be seen as an extension of some of her work in another medium, her earlier Dream and Dream-Mirror collage paintings. Pouran Jinchi’s early text work Untitled, based on poetry, is on display. This bold work with its deep red calligraphic marks aided by a confident approach shows one side of Jinchi’s studies of the visual and text and its content. Coming more than ten years later are the Tajvid works. These paintings present an aesthetic re-rendering of the pronunciation marks from pages of different Qorans. What is left out is the text itself. The diacritical marks Jinchi has rendered would help a reader precisely emulate the sound of divine speech, but here, untethered, they become yet another visual form of communication. Richard Tsao’s Freeze is of his most recent work on canvas. Those familiar with Tsao’s work will recognize his unrestrained use of color which seems to appropriately present itself in just the right balance. A look into Tsao’s studio and at his process helps explain. He manipulates pure pigment with an alchemist’s instincts in an approach that leaves his works in process, his floor, his walls and much else vibrantly colored. Tsao works with focused abandon on a group of paintings until after two or three years of labor, and what seems a duplication of the original chaos, he can bring forth a selected element, an artwork. Il Lee’s 1984 work on board and his latest acrylic and oil stick work on canvas will allow viewers to consider the breadth of approaches and media Lee has used in his investigations of drawing, of the negative and its positive, of line and form and of what is rendered and what is there but not rendered. Lee has become well known for his ballpoint pen works on canvas and paper, such as Untitled 978Q, ballpoint pen on paper, which will provide a touchstone between the other two works as the viewer appreciates how Lee’s monolithic focus has created a universe at once cohesive and yet still expanding in all directions. JEAN SHIN is nationally recognized for her monumental installations that transform castoff materials into elegant expressions of identity and community. Working in a variety of mediums, she collects vast accumulations of singular objects—prescription pill bottles, sports trophies, sweaters—which she alters into conceptually rich sculptures, videos and site-specific installations. Her work has been widely exhibited including solo exhibitions at the Smithsonian American Art Museum, Museum of Modern Art, and The Fabric Workshop and Museum. Her work has been exhibited at the New Museum of Contemporary Art, Museum of Fine Arts Houston, the Museum of Fine Arts, Boston, Asia Society, Brooklyn Museum, and Sculpture Center. Upcoming exhibitions include a solo exhibition at the Scottsdale Museum of Contemporary Art. She has received numerous public art commissions and awards including the MTA Arts for Transit Commission, Pollock-Krasner Grant, Louis Comfort Tiffany Art Award, and NYFA Fellowship in Sculpture. GWENN THOMAS’ digitized collage works on canvas depict elegantly composed harmonies of hue and form. Thomas’ series of prints often relate to her signature works on canvas and are dynamic, masterful orchestrations of abstract forms and marks realized by hands-on manipulation of printing plates. Recent solo exhibitions include Exile, Berlin; Art Projects International, New York; Yvon Lambert, New York; and Galerie Hafemann, Wiesbaden, Germany. Her work is represented in major public collections including the Metropolitan Museum of Art; Museum of Fine Arts, Houston; Philadelphia Museum of Art; Chase Manhattan Bank; Progressive Art Collection; Saatchi Collection, London; Citigroup, New York; and C.A.M., Fundação Calouste Gulbenkian, Lisbon, Portugal. POURAN JINCHI is an Iranian-born artist who borrows from her home culture’s traditions of literature and calligraphy to pursue her own aesthetic investigation. Her recent solo exhibitions include those at The Third Line Gallery, Dubai; Art Projects International, New York; and the Vilcek Foundation, New York. Her work has been exhibited at the Brooklyn Museum, Queens Museum of Art. Currently, her works are on view in Light of the Sufis at the Museum of Fine Art Houston. Two large-scale works on paper from her Tajvid series will be on view at Herbert F. Johnson Museum of Art, Cornell University this fall. Her work is represented in the Arthur M. Sackler Gallery, Smithsonian Institution; Federal Reserve Bank; and Brooklyn Museum. IL LEE is best known for his pioneering work with ballpoint pen that he began 30 years ago and continues today. Critically acclaimed and widely exhibited, his ballpoint pen work has been the subject of a retrospective at the San Jose Museum of Art and solo exhibitions at the Queens Museum of Art, the Vilcek Foundation and Art Projects International in New York. His work has, also, been exhibited at the Brooklyn Museum, the Smithsonian Museum of Art and the National Museum of Contemporary Art, Korea. Currently on view through September 26, 2010, is a solo exhibition at the Crow Collection of Asian Art in Dallas, Texas.